“On to Richmond!” The cry went up throughout the Northern states in the spring of 1861, urging Federal troops onto the newly named capital of the Confederate States of America. At stake was quelling an infant rebellion by 11 Southern states that had seceded from the United States after decades of sectional strife. Ultimately, four long years would pass and more than 620,000 troops on both sides would perish before Federal troops entered Richmond, effectively bringing an end to the American Civil War. Today you will find a wealth of opportunities to visit the sites where these defining events of our nation occurred and learn the stories of the soldiers and civilians who struggled to survive in and around the wartime capital. Established in 1936 to preserve important battlefields of the campaigns to capture Richmond, the park is dedicated to preserving and teaching about some of the war’s most critical campaigns. 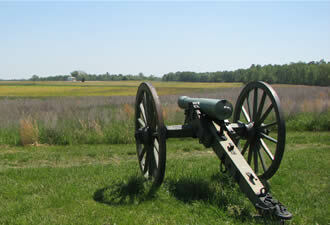 Eleven of the park’s 13 units preserve four significant Civil War campaigns, including the May 15, 1862 naval engagement at Drewry’s Bluff; the 1862 Seven Days’ Battles (at Beaver Dam Creek, Gaines’ Mill, Glendale and Malvern Hill battlefields); the 1864 Overland Campaign at Totopotomoy Creek and Cold Harbor; and actions during the Richmond-Petersburg Campaign, from September 29, 1864 – April 2, 1865, encompassing Fort Harrison and Parker’s Battery. Begin your visit at the Tredegar Visitor Center, located in one of the original buildings of the Confederacy’s most famous ironworks. Here, exhibits and audio-visual programs introduce the story of the battles and provide information and maps to tour the battlefields and other Civil War sites around the city. Also at Tredegar is the American Civil War Center, operated by a National Park Service partner, whose museum is the first in the nation to interpret the Civil War from the Union, Confederate, and African American perspectives. 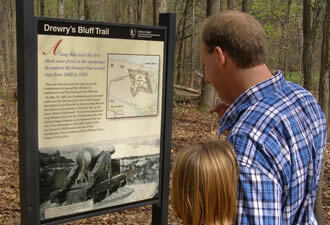 In addition to Tredegar, the park includes four additional visitor centers, located at Cold Harbor, Glendale/Malvern Hill, Fort Harrison, and Chimborazo. The Chimborazo Visitor Center also houses a medical museum, where the Confederate medical story is presented on the site of Chimborazo Hospital, the Confederacy’s largest such operation. 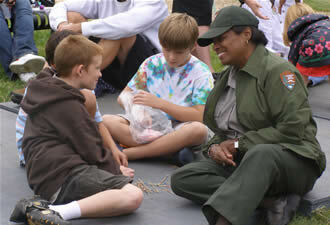 Throughout the year National Park Rangers present a variety of talks, tours, living history demonstrations and special events that commemorate the park's rich heritage. Saturday, April 17, 2010 marks the annual Civil War and Emancipation Day at Tredegar Visitor Center, with cannon and rifle demonstrations, living history encampments, walking tours, and more. Check the schedule of events for a full list of this summer’s upcoming programs. While you’re in Richmond, be sure to visit the Maggie L. Walker National Historic Site, home of one of America’s early leaders in the campaign for civil rights for women and African Americans. She also was the first African American woman to found and lead a bank. Exhibits and guided tours of Maggie Walker’s home provide insight into the life of this great woman, who was born during slavery and achieved success despite segregation and the limited opportunities offered to her race.